Nagzira sanctuary is known for its verdant hills and dales, where the fauna offer a mesmerizing blaze of colors. Chandrapur and Bhandara districts in Vidarbha region are entirely well known for their dense forest. It is said that there were once elephants (‘Nag’ means Elephant in Sanskrit) in this forest, which is how the name Nagzira came to be. The majority of the dwellers here are tribal. 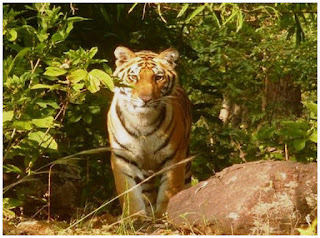 Because of dense forests the wildlife is also rich. Another special feature of this region is its lakes which have helped for the faster growth of jungles. Nagzira Sanctuary, situated in these jungles, sprawls over some 153 square kilometers. Wild and rugged and watered by perennial sources, the jungles support a diversity of wildlife. The summer heat is rather intense here, as elsewhere in Vidarbha, but the dense vegetation has a moderating influence and the winters are pleasant. Nagzira sanctuary has rest houses. There is also a lake set in the midst of dense trees. The mammals including Sambars, bisons, bears, tigers, panthers, sloth bears, antelope, blue bull, spotted deer are some of the animals which can be spotted here. The Indian Bison is yet another special attraction at Nagzira. Distance : Gondia to Nagzira – 25 kms, Napur to Gondia – 130 kms. Great blog. I enjoyed reading your article. I am interested to see the wildlife parks. Ur article is helpful to me for ever . See more information about Nearest places to Gondia for ur travelling. Naag is a Marathi word and the name Nagzira is due to a temple of snakes situated there.